With a stay at Marblau Hostal in Santanyi (Cala Figuera), you'll be minutes from Cala Figuera Beach and close to Cala Santany Beach. 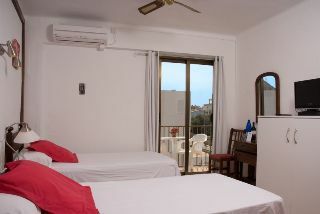 This hostal is within the vicinity of Cala Mondrago Beach and Cala d'Or Marina.Rooms Make yourself at home in one of the 16 air-conditioned rooms featuring refrigerators and LCD televisions. Rooms have private balconies. Complimentary wireless Internet access keeps you connected, and satellite programming is available for your entertainment. Private bathrooms with showers feature rainfall showerheads and hair dryers.Rec, Spa, Premium Amenities Make use of convenient amenities, which include complimentary wireless Internet access and tour/ticket assistance.Business, Other Amenities Featured amenities include multilingual staff, luggage storage, and a safe deposit box at the front desk. Free self parking is available onsite.